While the number of reported attacks is slightly higher than the most recent five-year annual average of 83, the five fatalities are just below the average of six deaths per year. Of the total, 60 percent (53) occurred in the United States. Australia had the second-highest number of attacks with 14, including one fatality. 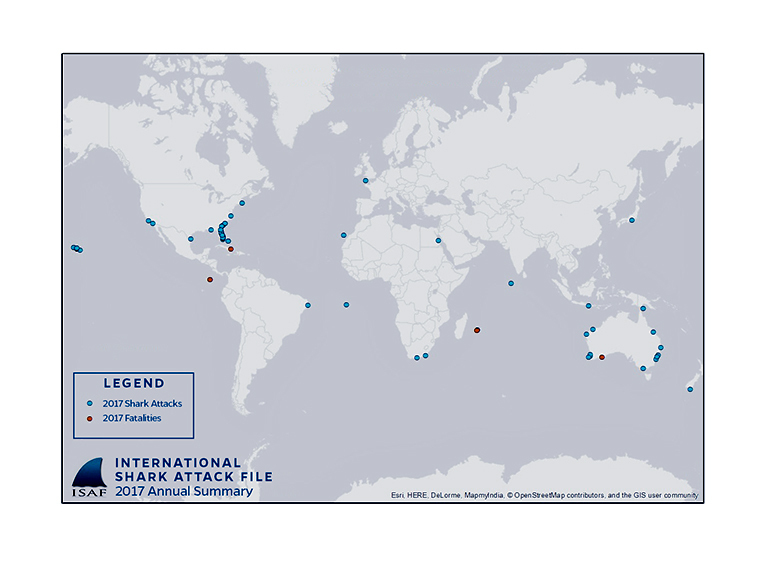 The slightly higher than average attack numbers were expected as human populations continue to climb and people spend more time in the water, says Lindsay French, who manages the database housed at the Florida Museum of Natural History at the University of Florida. Worldwide, Reunion Island had three unprovoked attacks and two fatalities. Ascension Island, the Bahamas, Costa Rica, Indonesia, and South Africa each had two attacks, with one fatality occurring in Costa Rica. Brazil, the Canary Islands, Cuba, Egypt, England, Japan, the Maldives, and New Zealand reported single attacks. Cuba’s attack resulted in the country’s first fatality since the 1930s. “The hotspots we’re keeping an eye on are Ascension Island, which had its first attacks since the 1800s, and Reunion Island, which had two of last year’s five fatalities,” French says. In the US, other states reporting attacks were South Carolina (10), Hawaii (6), California (2), and Massachusetts, North Carolina, Texas, and Virginia, each with one. Fifty-nine percent of the attacks worldwide involved board sports. This group spends a large amount of time in the surf zone, an area commonly frequented by sharks, French says. The world’s shark populations continue to suffer as a result of overfishing and habitat loss, French says.